Based on the true story of a businessman who was kidnapped twice and held for a $6m ransom, Jackie Chan (in a role initially offered to Jet Li) plays an impulsive cop sniffing out corruption in the Hong Kong police force. The demolition of Hong Kong’s notorious Walled City is used to great effect in an explosive finale where a frantic Chan attempts to save the life of his crooked police partner (Kent Cheng). Kirk Wong directs with a gritty realism attacking the power and influence of Hong Kong’s triad organisations. It is also refreshing to see Chan play a straight role as a pressured cop pushed over the edge. 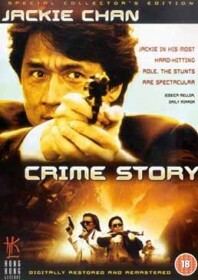 Most Chan fans may not enjoy seeing him play so purposefully against type, but nevertheless, Crime Story is still an important and under-appreciated film.